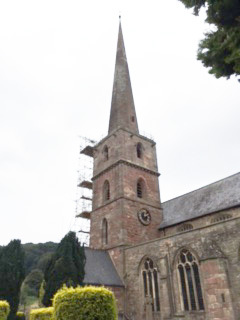 Ecclesiastical Steeplejacks have now started work on the Spire. Hanging scaffolding has appeared on the outside and work has also begin inside. 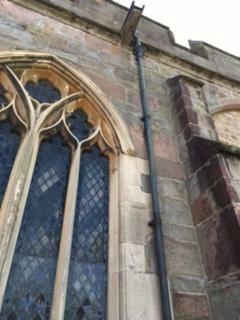 Over time the top section of the spire will be removed and remedial work will be conducted. It's great to finally see the work starting! After securing the HLF Grant in April, the project team then contracted the remedial work out, to be undertaken during the Summer. However, due to injury, the chosen contractors were subsequently unable to start as planned and we are now working out how best to proceed. 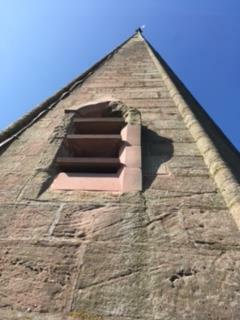 We must have completed all project work by November 2019 in order to keep within the remit set out by the HLF, which gives us plenty of time to replan and ensure our Spire is fixed and the bells can be rung again! We will provide further updates when we know more. The bells at St. Michael & All Angels Church have been silent for several years, due to structural issues with the church's large spire. 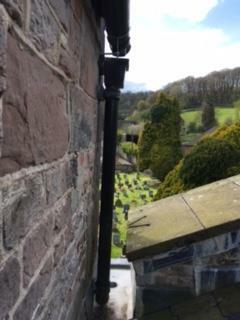 In April 2018, the Parochial Church Council were thrilled to gain approval for a £46,300 grant from the Heritage Lottery Fund (HLF), which will make the spire safe and allow our bells to be rung once more! Dating from at least the 13th Century, the grade 1 listed church building is home to eight bells which date from the 1700s. Until structural issues halted use, an enthusiastic band of ringers held a weekly practice and rang for services, including weddings. Once the remedial work is completed, the band of ringers will be able to resume their activities and begin to teach those interested in learning, as well as hosting visiting bands from the wider region. The church project will also seek to educate the local community and visitors on bell-ringing, the church's heritage and our recent restoration work by providing displays at prominent events during 2018 and 2019. These include the very popular Mitcheldean Folk Festivals, the national Heritage Open Days and an "Open Tower" Day in 2019. 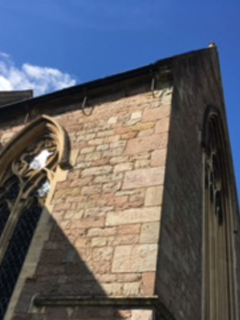 Visits by pupils from Mitcheldean Primary School will also be arranged, which will enable them to learn more about bellringing and the church's heritage. 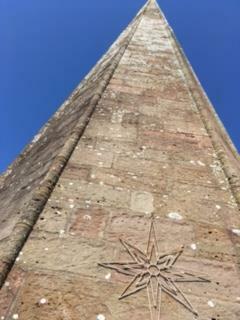 The next steps for the Project team during Spring 2018 are to work with Nick Joyce Architects Ltd and Frank W.Haywood & Associates Structural Engineers to commission the building work on the spire. Then work can begin within the church community and bellringing team to assemble information for the heritage displays. More to follow! Thanks to National Lottery players, we invest money to help people across the UK explore, enjoy and protect the heritage they care about - from the archaeology under our feet to the historic parks and buildings we love, from precious memories and collections to rare wildlife. 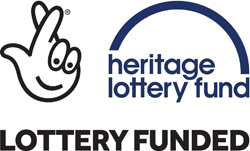 Visit us at www.hlf.org.uk. Follow us on Twitter, Facebook and Instagram. 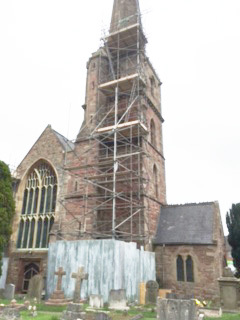 As you may have seen and heard, the bells at Mitcheldean Church have now been silent for over a year and in 2016, scaffolding had been erected around the tower. 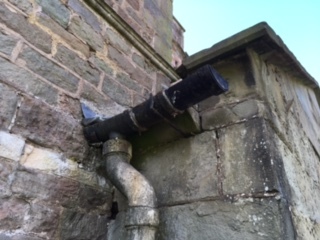 A mix of restorative and preventative maintenance work has been underway to ensure the building remains in good working order for the future. 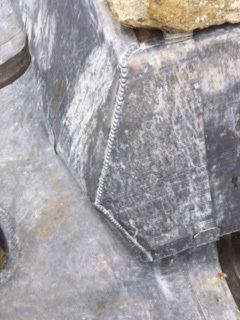 Phase One of this work has now completed and funds are being sought for Phase Two, known as "Securing the Spire". Phase One - What work was needed? 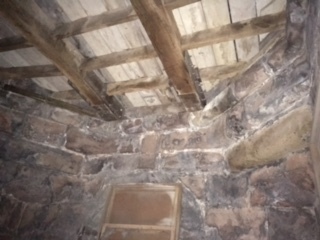 Following our Quinquennial Building Inspection in 2014 and additional investigations to the spire and tower, it was discovered that a great deal of work was required on the internal and external structure of the tower and the spire itself (in terms of stonework, repointing and wooden and metal internal supports). 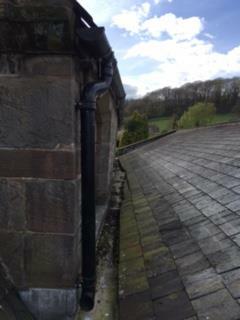 Additionally, a large amount of preventative work (such as the replacement of guttering and downpipes) and general repair (such as the replacement of coping stones) was also required. Working with Nick Joyce Architects Ltd and our chosen primary contractor, McAllister Masonry Ltd, a schedule of work was agreed for Phase One, with further phases of work to be planned in the future. Phase One - Who was supporting us? We were fortunate enough to have received several grants in 2016, without which we could not have begun the required work. 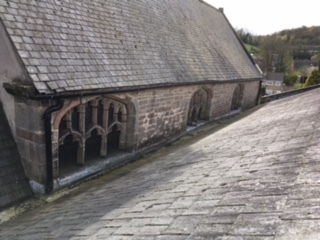 Back in late 2015, we applied to the Listed Places of Worship Roof Repair Fund, who agreed to provide a large grant. As the project scoping progressed and likely costs increased, this fund very kindly agreed to increase its support to match. Ever a supporter of work on our churches, the Gloucester Historic Churches Trust also agreed to fund the project. Further grants were forthcoming from the All Churches Trust and the Warneford Ecclesiastical Charity for which we are also grateful. 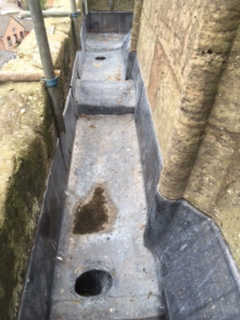 As of August 2016, all work on the Tower Parapet guttering had now been completed and coping stonework above the nave had been replaced. Preliminary investigations into work required in Phase Two had also taken place on the tower. As of March 2017, all remaining work in Phase One had completed. 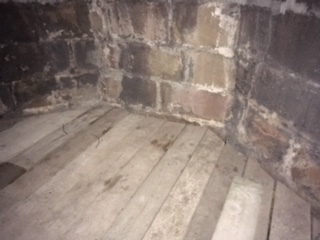 Urgent repointing to the tower stonework had been undertaken, repairs to the timber staging inside the tower had finished and rainwater goods in many places around the church roof had been repaired or renewed. Alongside completion of the works outlined above, a draft schedule of works has now been provided for Phase 2, which will look to remove excess travel in the spire by changing the metalwork inside and out. It was originally hoped that this could be undertaken as part of the first phase but cost and complexity led to the decision to descope this element and manage it separately. This work will require substantial additional funding, which is currently being sought.